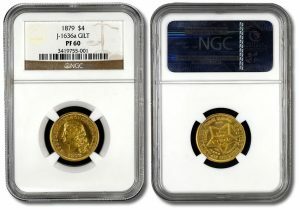 Numismatic Guaranty Corporation (NGC), the world’s largest third party coin grading company, will be unveiling a remarkable display of rare and important coins and medals at the American Numismatic Association’s World’s Fair of Money in Philadelphia, Pa., August 7 through 11, 2012. Numismatic Guaranty Corporation (NGC), the world’s largest third-party coin grading company, has graded and encapsulated what may be the world’s most valuable coin. Numismatic Guaranty Corporation (NGC), a Florida-based independent coin certification and grading company, announced today it has graded 25 million coins — becoming the first grading company to reach this milestone. 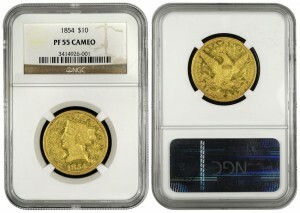 Numismatic Guaranty Corporation (NGC) recently identified and certified a proof 1854 $10 gold piece. The coin grades Proof 55 Cameo. 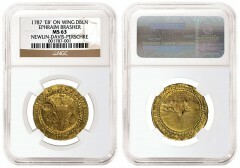 While a small number of lower denomination proof coins are known from this year, notably examples of the first year of issue $3 gold pieces, this newly identified example is the only known Proof 1854 $10. 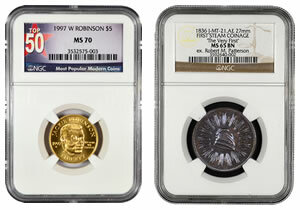 Numismatic Guaranty Corporation announced a new resource tool for past and future auctions of NGC-certified US coins. 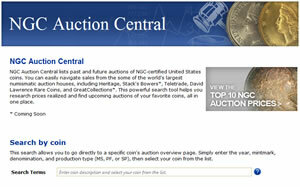 Named "NGC Auction Central," it offers a centralized location to find realized coin prices and upcoming offerings from leading auction houses around the U.S. The following is the statement released Monday, October 3, by NGC. It is published in its entirety. Numismatic Guaranty Corporation (NGC) announced the release of the most comprehensive online reference for US coins today. 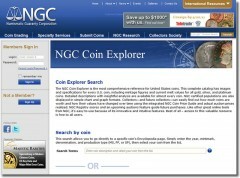 The new NGC Coin Explorer is a free research tool designed as a resource for both dealers and collectors, whether buying or selling coins.